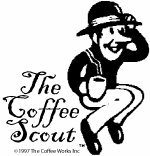 Coffee growers of Southern Africa have overcome many obstacles in the hundred years since the members of the Moodie Trek first brought this new crop to the Eastern Border region of what was then known as Southern Rhodesia. Although blessed with favorable climate and topography, coffee growing was virtually abandoned when disease destroyed most of the small plantations in the 1920’s. It was revived by farmers from India and Kenya in the late 1950’s, who brought with them modern methods of production. Still in its adolescence, coffee production encountered another roadblock following the declaration of minority rule in 1969, and the imposition of the international trade embargo. The trading of coffee from the Eastern Highlands during this period remains the subject of some intrigue. The de facto marketing was handled by an established firm of coffee and tea brokers in South Africa. Also during this period a quantity of quality washed arabica coffee mysteriously made its way onto the world market via the port of Beira in Mozambique, bearing a somewhat arcane coffee “code” marking (e.g. code 53). With independence and democracy in 1980, Zimbabwe (which means “stone house” in the language of the native majority Shona people) joined the International Coffee Organisation and began the long process of building a distinctive coffee identity and reputation. 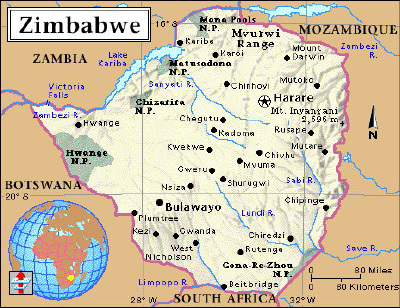 In Zimbabwe today coffee is grown by approximately 140 registered commercial farmers and 1600 smallholder farmers. Eighty percent is grown in the South East in the Chipinge district, at an altitude of 1200m (4000 ft.). The harvest period is from June to November. The majority of farmers grow the SL28 variety; developed in Kenya in the 1930’s and reknowned for its aromatic, winy acid cup. They harvest in up to 12 pickings of each tree, immediately wet-processing and then sun-drying the cherries for 6 to 8 weeks. It is then delivered to the mill in Mutare, where it is classified, milled, and graded for export. Pinnacle is the marketing name given to the “flagship” coffee produced on just eight carefully selected farms. Hand-selected at estate level, screen size 19 or better, deep blue-green beans with zero defects, these are truly the cream of Zimbabwe’s (maybe the coffee world’s) crop. Like the finest coffees of their neighbors to the North, this Zimbabwe offers rich winy aromas and clean acidity. The report is a well-balanced rounded cup, with good body and a pleasant citric flavor. More than this you’ll have to taste for yourself. 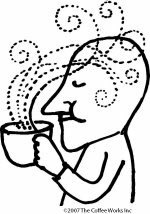 We invite you to enjoy this extraordinary coffee with us now, before this becomes another Pinnacle unobtainable by the merely mortal.